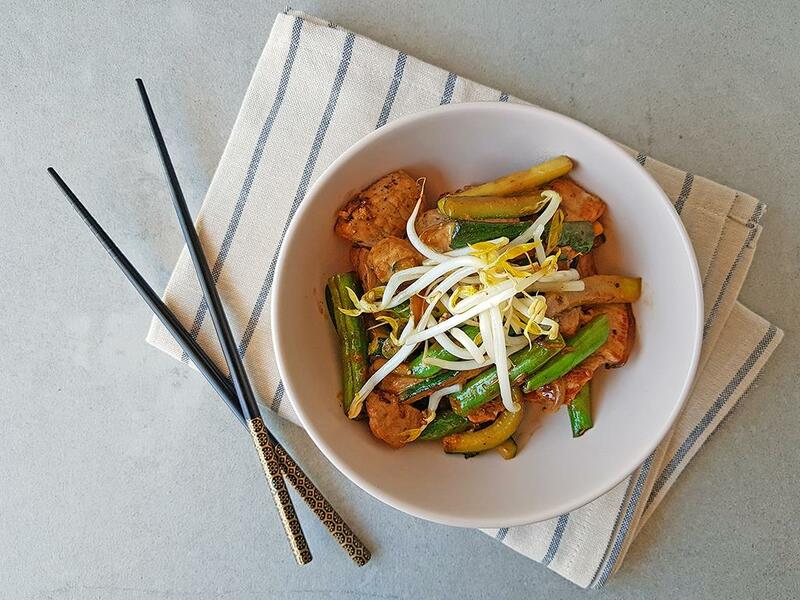 Pork stir-fry with veggies, coated in a cashew sauce and served topped with bean sprouts. Courgette matchsticks: First cut each courgette in half crossways, then slice each piece in half lengthways (5mm). Finally place each piece down flat and cut lengthways again into matchsticks (about 5mm wide). Sauce: Mix together the ginger, garlic, cashew butter, Carb Smart sweet chilli sauce, soy sauce and water (see quantity above). Pork chops: Cut into strips then coat in olive oil and season with salt and pepper. Place a pan on medium-high heat and when hot, add the pork. Brown for 5-6 minutes, then remove and set aside. Stir-fry: Using the same pan on high heat with a drizzle of olive oil, add the red onion with a pinch of salt. Then add the courgettes and green beans and sauté for 4-5 minutes until cooked, but with a slight bite. Add the pork strips and sauce to the veggies and mix through. Serve the stir-fry topped with a drizzle of olive oil and the bean sprouts. "Not enough food for 2 people and the bean sprouts went off the day the food was delivered"